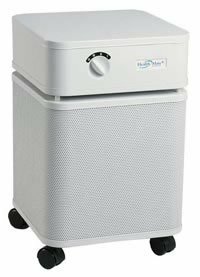 The Air Purifier for people with Chemical Sensitivity. Cleans a 1,500 sq.ft. room every 15 mins. Free shipping in the continental USA. For people with chemical sensitivity, the HealthMate Superblend contains an additional layer of filtration ( potassium iodine and zeolite ) to remove formaldehyde, ammonia, and other harmful chemicals. Carpets, wood paneling and furniture may be significant sources of chemicals. This is particularly true of new homes and offices. Cleans 1,500 sq. ft. room --- 5 year money saving filter life.